A River Escapes sightseeing cruise offers an unrivalled way to experience one of the North's great cities and its evolving riverscape. Taking you from past to present, from our once thriving maritime heritage, to world renowned landmarks such as the Gateshead Millennium Bridge, the Tyne Bridge, the Sage Gateshead and the Baltic Centre for Contemporary Art. Each cruise is accompanied by fascinating commentary from River Escapes' knowledgeable guides. While on board why not sit back and relax with a drink from our well stocked bar or enjoy one of the tempting snacks on offer in the comfortable surroundings. Scheduled cruises run throughout the year. 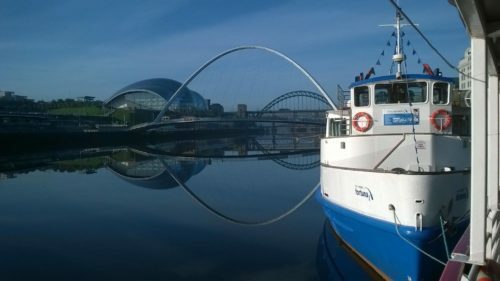 2 hour Quay to Countryside - Tuesdays & Thursdays - sails from our River Escapes pontoon (near millennium bridge) - This cruise takes you under 11 bridges on the Tyne and is an excellent opportunity to catch some wildlife from the heart of our city. With recorded Commentary. 3 hour Quay to Sea - Tuesdays, Thursdays & Sundays - sails from our River Escapes pontoon - Experience the Millennium Bridge opening for the beginning of your cruise and observe the changing landscape of our river all the way down to the mouth of the Tyne. Freshly made hot food available. Narrated by a live commentator. Please note you can purchase any remaining places at the boarding points on the day. We accept credit/debit cards on our Fortuna vessel when purchasing food or drink from the bar.